Earlier Commons leader Andrea Leadsom said she had been made aware of technical problems with the site, but she dismissed the petition as not being on the same scale as the pro-Brexit vote in the 2016 referendum. 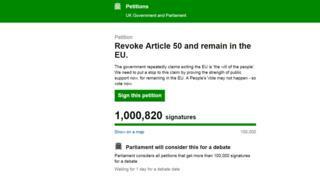 At one point, the petitions committee said there were nearly 2,000 signatures a minute. The petition currently has long since passed the 100,000 signatures that means it will be considered for debate. The Article 50 petition is not the most popular ever on the Parliament website. 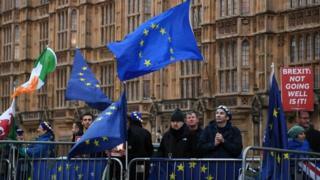 A petition for a second EU referendum in June 2016 attracted more than four million signatures and was debated in the Commons – but thousands of signatures were removed after it was discovered to have been hijacked by automated bots. A petition to prevent US President Donald Trump from making a state visit attracted 1.8m signatures.